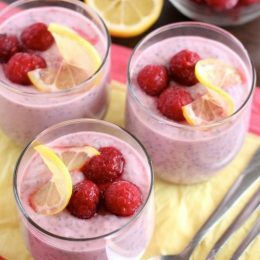 Lemon Raspberry Chia Pudding Recipe showcases the bright flavors of Spring and Summer made into a healthy breakfast, snack, or dessert! Hi y’all! My name is Amber, and I’m excited to be a new contributor here at Super Healthy Kids! There’s something about the weather warming up in the Spring-time that just makes me crave fresh fruit and bright flavors – mainly citrus. I kind of have a citrus addiction, but don’t tell anyone, okay? Thanks! 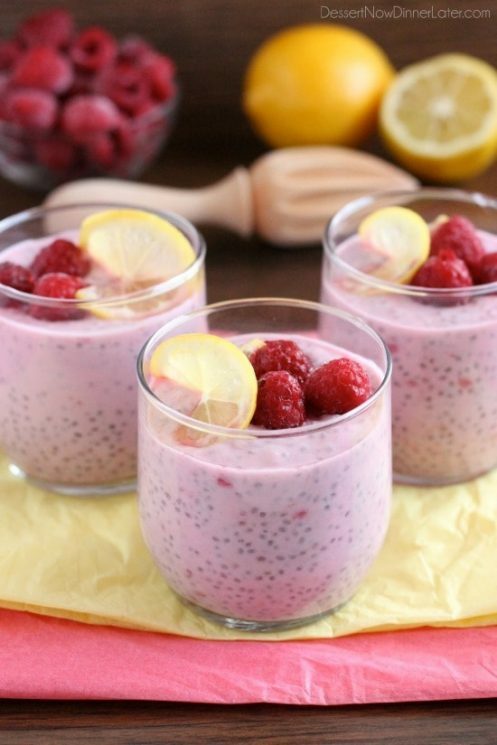 Well, this Lemon Raspberry Chia Pudding is a great cross between something sweet and something tangy with those favorite flavors of Spring and Summer – citrus and berries! The prep for this pudding is simple. Mix all the ingredients together in a large container. … waiting for the chia seeds to do their magic and thicken the mixture to a pudding-like texture. I like to make this chia pudding at night and have it for breakfast the next day or save it for an afternoon snack for my kids. 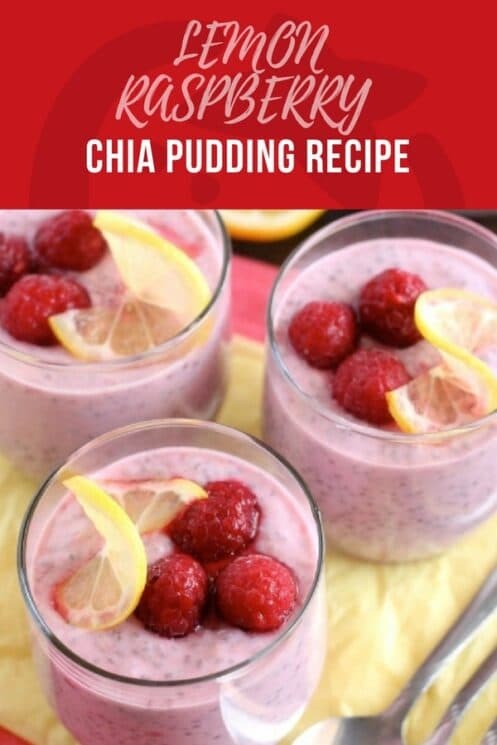 Chia pudding also makes the perfect healthy dessert alternative for after dinner. If you don’t already know, chia seeds are a great source of antioxidants, fiber, and quality protein, to name a few. They are definitely worth trying. I also love to to put them in my recipe for Tropical Overnight Oats. Chia pudding is so very versatile! The base is just Greek yogurt, milk, chia seeds, and honey. Then you can add whatever whole or pureed fruit you like to it. I am loving this raspberry-lemon version though. It’s just a gorgeous shade of pink and tastes great! I hope you decide to give it a try. ~Amber Brady is a wife, mother, mormon, and culinary graduate who shares her favorite recipes, tips, tricks, and tutorials on her blog Dessert Now, Dinner Later to help you be an outstanding home cook with culinary know-how! Combine all ingredients in a large storage container that has a lid. 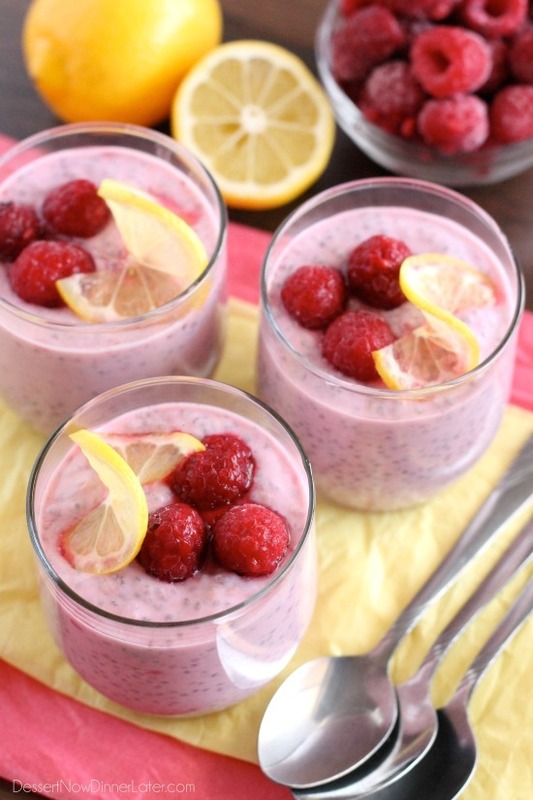 Make sure all the chia seeds are mixed in, and mash the berries lightly, especially if using frozen raspberries. Place the lid on the container and refrigerate overnight or for at least 8 hours. Serve with extra raspberries, and a drizzle of honey if desired. *You can substitute any kind of milk for the coconut milk. *The lemon peel (zest) and lemon juice is equal to 1 medium lemon. *You may use fresh or frozen raspberries. If you don’t have coconut milk – what would you suggest? Just regular milk? You can substitute any milk. You might want to add 1 more Tablespoon of chia seeds if you use a low fat or fat free milk to help it thicken up nice for a pudding-like texture. Enjoy! anythibg I could replace yogurt with? We have one child with a dairy allergy. Desperately looking for healthy breakfast foods with protein! Go ahead and replace the yogurt with extra dairy free milk and double the chia seeds. So 2 cups of the dairy free milk of your choice and 1/2 cup of chia seeds. Good luck! How long will this last refrigerated? I have send grass fed plain yogurt and doesn’t expire till June so was wondering if it would last long in fridge? I probably wouldn’t keep it longer than a week. Would the Chia seeds still be able to thicken properly if the mixture was blended? Yep, that’ll be just fine. This little recipe is a HIT in my household. It’s quick and delicious. My husband is thrilled every time I make it. Thanks for sharing! I’m so glad you enjoy it so much Ashley! That ‘s fantastic! Thanks for sharing your experience! Is that plain coconut milk from a can or the coconut milk beverage in a carton? Coconut milk from a can 🙂 You could try from a carton – we just haven’t made it that way yet! Can you use whole fat yogurt instead of Greek? I’ve used both! Definitely a personal preference. What a great and satisfying pudding! I’m new with chia and will definitely be including this regularly. Thank you for sharing and expanding my go to recipes.